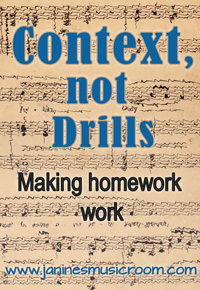 There is a lot of debate about homework these days. When I was in school, homework was pages of multiplication problems, or reading a text and answering simple recall questions (usually worded identically in the question and the text, so it was easy to scan and find the answer). I would like to believe that is not happening so often anymore, but I know from my own conversations that some teachers are unsure about the learning and practice they are sending home, so I thought I’d share my own thoughts. The knowledge and skills we gain in school do not exist in a vacuum; they are not there just to add to a skill set. My subject is music, and I used to drill students on notation—a fairly advanced skill, and not a very exciting one to learn. But I have learned that not many things are exciting when they stand alone. Learning needs a context. Instead of presenting students with a staff and a rhythm pyramid, I gave them an instrument. Now we can create music and then understand why we would want to write it down, or we learn to read music better so that we can play increasingly advanced music. Suddenly notation has a greater purpose, and the students are much more motivated to learn! The same thing works for math. It’s not just about manipulating numbers, but a thought process. Give students logic puzzles and word problems so that they have a reason to learn probability or division. Provide a context that presses them to learn and practice those new skills. And you could say the same about habitats, history, the water cycle, color mixing… anything. Give the students a problem to solve, and by necessity (and with much more motivation) you will be able to bring in the skills.